This post will cover the May Day / Beltane ritual and celebration held by the Circle of Fountains. 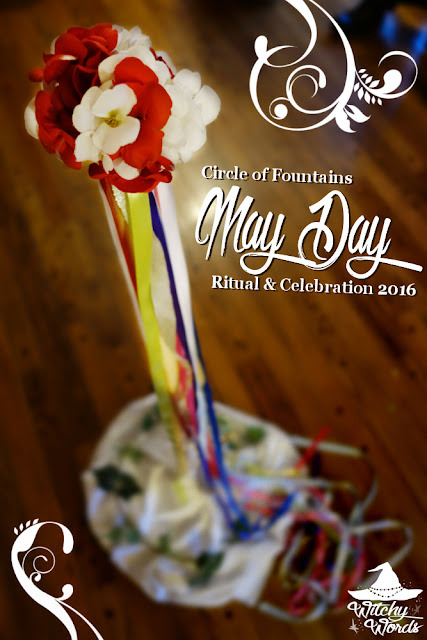 To see the Circle of Fountains 2015 May Day ritual, click here! Circle of Fountains has a Facebook page! Click here to check it out! 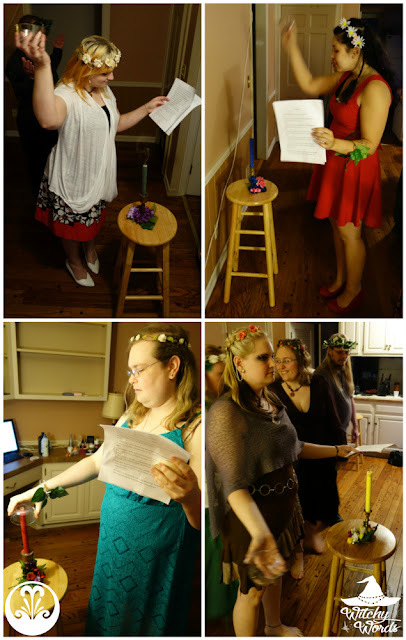 This year's equinox ritual was held by Phaedra! Phaedra identifies as a Kitchen Witch with a heavy emphasis on home and family. Her husband, a Christian Taoist, actively participates in our circle and helps not only Phaedra but our entire group with our rituals. Our circle prides itself on variety of beliefs and practices, emphasizing those differences as a necessity for community and togetherness. By having members each traversing a different path, we open ourselves up to everything the human experience has to offer. I want to thank Andrea for opening up her home for ritual this sabbat. My home is currently under maintenance and the basement is unfortunately unavailable right now, but Andrea's den worked perfectly for our ritual needs! 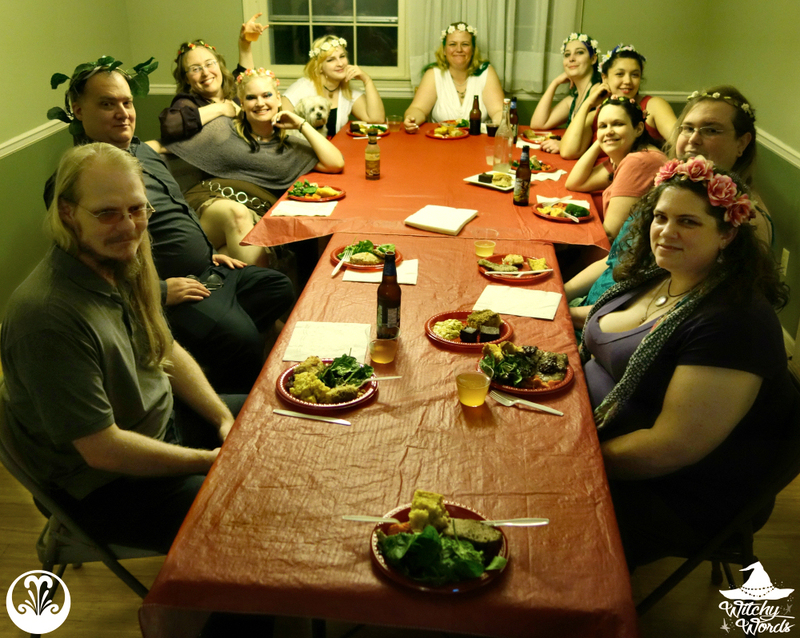 I also want to thank Laura for doing everyone's hair up in fantastic braids with the floral crowns Phaedra provided! Of course, no ritual is complete without a few familiars around. And that includes some of our circle's vessel and stuffed familiars. 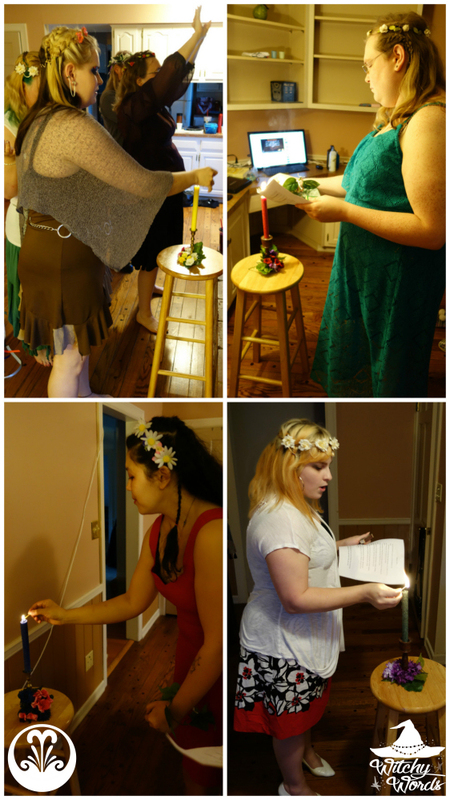 We began this May Day's celebration with ritual first, starting with the quarter calls. Phaedra also lit a candle for each person in the circle to quietly call upon spirits or deities they'd like to welcome in with us. 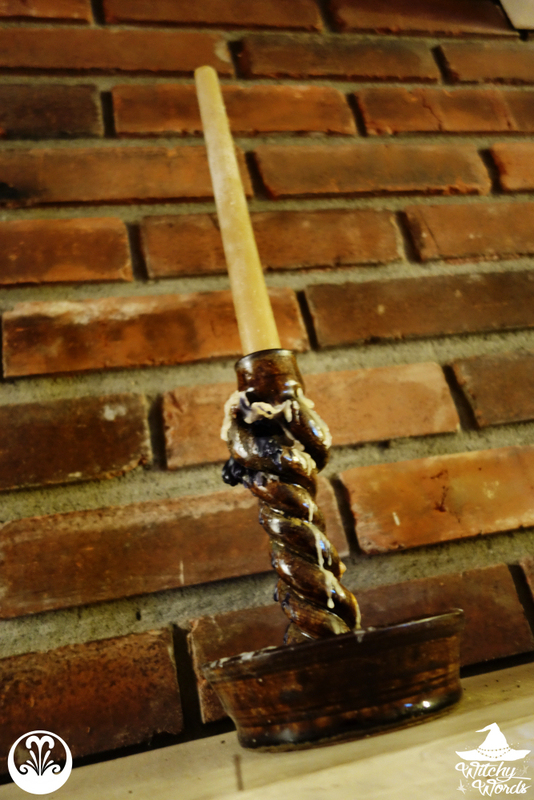 By the way, take a look at this gorgeous candle holder. 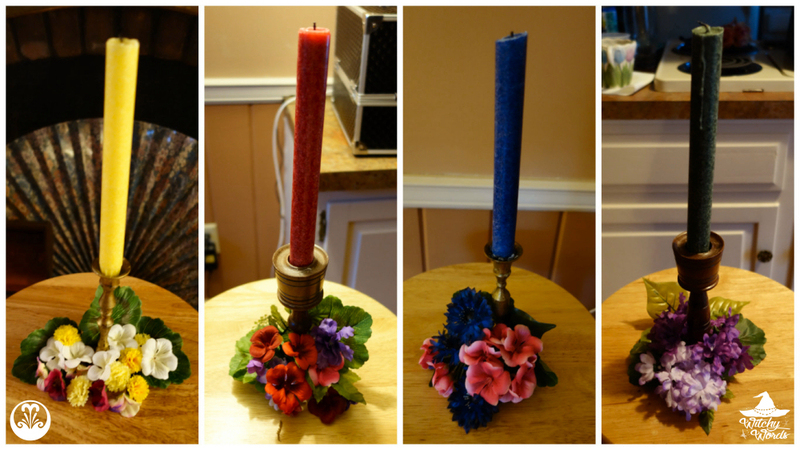 Phaedra made this candle holder for this specific purpose in high school ceramics. How amazing is that? All that wax you see on it has built up from years of use. It makes this candle holder a particularly important piece of her rituals. This sabbat is the pinnacle of union and fertility. Today is about the masculine and the feminine joining in a creative act. This isn't about gender or genitalia. It is about Yin and Yang, Solar and Lunar and the marriage of our own opposites like intuition and intellect, heart and head. She explained the various meanings throughout different belief systems, such as the union of the Maiden and the Oak King, the thinning of the veil for the fae, and the fertility of not just our bodies but the earth and our labors. For these fertile ventures, she created charms with symbols that represented things we've been invested in, such as business, health, love and so forth. Each charm was sealed an essential oil blend. In addition, since many of us in the circle are not planning on having children, she marked our charms with an anti-baby sigils. I want to take a moment to point out that many people think sigils have to be these mysterious, detailed symbols. Sometimes, simple and straight-forward is the perfect way to go! In order to charge our charms, we held them tightly while we danced the May Pole to Godsmack's Voodoo. Once we were done, Phaedra knotted it in a bow and our May Pole dance was complete! ... And dismissing our deities and spirits if they so wished to leave. And thus, we went on for dinner! 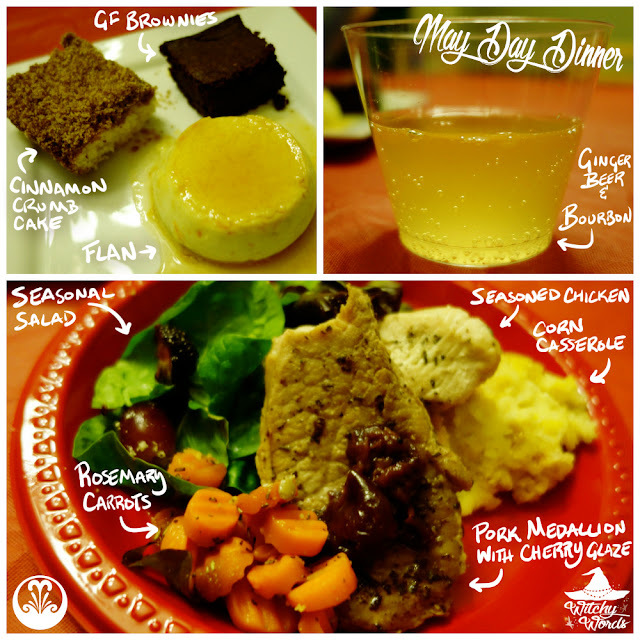 We decided to hold our potluck after ritual this holiday to recuperate from the energy of the ritual itself. It was much needed! And that concludes the May Day festivities from Circle of Fountains! 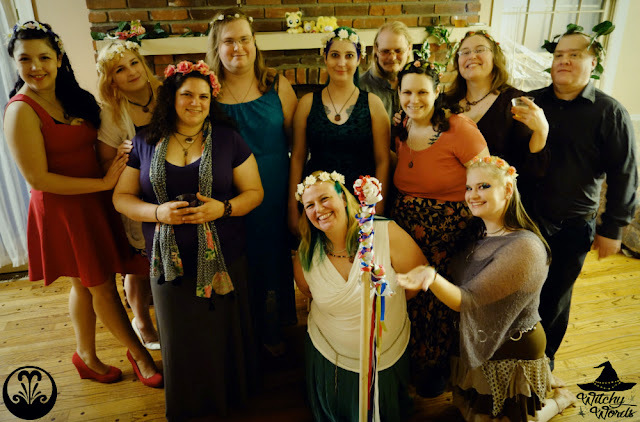 From my circle to yours, have a wonderful Beltane! To see the previous Circle of Fountains sabbat ritual, the Spring Equinox, click here! The kitchen witch in me always liked looking at the menu your circle has! Everything always looks delicious! And what is a stuffed familiar? Thank you so much! I have to give the menu up to the circle coming up with wonderful dishes and our Nutritionist, Kolika, giving guidance. And, funny you should ask: I have Phaedra working on an article about that exact question! Since I don't have any, I don't feel like I could give a proper answer to that. Awesome, I'm looking forward to reading it! Marietta, Can you share anything about your flower crowns? I just made my first one last night and it's not as even looking as the ones Phaedra made in your post. Being an artist, and a Virgo, of course I want perfection. LOL. I'll do some research online but any tips would be appreciated. Ps: I am making them for this Saturday...we are attending Fairy Fest. I'll include the link below. Honestly, a local store was having a sale of buy three, get three free. Phaedra purchased them using the sabbat fee budget money. She did, however, make the vine laurels from the guys using faux vines and ribbon, braiding them together. I don't know if that helps any though! Sometimes Just knowing how others put it together can help! Thanks! I finished mine...now just to see how they hold up on saturday! Having one inside was interesting, word of advice if you ever need or try to have a may pole inside. Make sure you can weigh it down so you don't have a husband having to hold it while we are all laughing and dancing away. Outside you would have the ability for longer ribbon and more people, but there was a nice vibe to being indoors and having fun. Actually, J totally had to hold down the may pole for the outdoor ritual too. That's the problem with mobile may poles - they're mobile! I hope you had a good Beltane, Stacy!